In a fantasy world where money isn't an object and the wife is a dead ringer for Keira Knightley, I suspect the typical HCC reader might desire a small but wholly state-of-the-art commercial cinema. Back in the real world, budgeting close to £5,000 for AV disc-player and multichannel amplifier for your own home is still a huge ask. What you want is over 95 per cent of the performance of ultimate high-end kit and still have space on the plastic for half a dozen Blu-rays and a bag of buttery popcorn. In fact, if you were to dream up a performance wish-list for said £5K outlay, it might look a bit like this: razor-sharp picture performance with a black level so inky you could bottle it and sell it to Bic; warm vibrant colours, with excellent flesh tones and flawless gradation; shadow detailing only a smidgeon worse than Denon's DVD-A1UD or Pioneer's BDP-LX91; super-smooth motion scrolling; and a huge, solid and dynamically-charged soundstage that one could measure in acres. Perhaps there wouldn't be a full THX spec with post processing, nor the finite detailing of a high-end processor, nor the sumptuous ease of a monster power amp, but it would be oh-so-close. With each movie you'd get a shiver of goose bumps in anticipation of the main event, the operation would be seamless (eventually, when you got used to it) and the build quality would feel as well screwed together as a German car. And that neatly sums up Denon's AVR-4810 receiver and BDP-4010UD universal player partnership. You simply can't fault this pairing for the money. They rock. As a combination they play just about everything very well; look and sound great, and are packed to the rafters with features. Okay, you don't get the über-high-end power supplies, triple laminate chassis and speaker terminals you could anchor a small ship to – like Denon's awesome A1HD products. If there is any chance you can fit height and width speakers in your living room without wrecking the decor or inciting divorce proceedings, then this is the amp for you. The receiver's features count is absolutely splendid, including all the usual decoding formats, a serious 140W-per-channel (claimed) and a new 32bit DSP chipset. You get six HDMI inputs including one on the front, plus USBs, Ethernet and integrated Wi-Fi – which connected and updated the firmware seamlessly, as well as linking direct to Napster. There's a plethora of install features, including remote extenders, IR repeaters and 12V triggers as well as main-plus-two-zone multiroom and, uniquely, an optical output for Zone 4. Surreal. 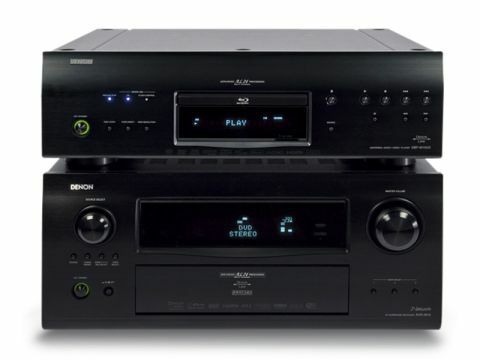 The BDP-4010UD is no less special in that it is a true universal player handling Blu-rays, DVDs, CDs, SACDs, DVD-As, DivX and a variety of compressed audio formats on CDRs. I bought into SACD and DVD-A in the vain hope that the mass-market would get excited by high-res audio, and the BDP-4010 does them significant hi-fidelity justice. Of course, it has 1080p video scaling by Anchor Bay, Ethernet connectivity, Denon's proprietary AL24 processing and an SD card reader/writer to boot. The menu is huge and complex, no feature is left wanting and its architecture is fully upgradeable over the 'net. While both products would comfortably scoop rave reviews in their own right, it is the sum of the parts that makes this assembled combination very special. Both are equipped with DenonLink 4th Edition, which allows the intricate high-speed digital clocks of each component to synchronise to pico-second accuracy via a jitter-reducing circuit in the receiver. Simply put, connect player to receiver with an HDMI cable and a Cat5 or Cat6 lead and digital jitter in the HDMI audio transfer is eliminated. The result is a crisper, more accurate sound with oodles of space and detail in the effects and dialogue. The opening sequence of Star Trek (the new de facto review Blu-ray, I think) is gorgeously rendered with a tangible quality that wholly disguises the CG effects and generates a huge 3D star field in front of your eyes. The black levels lend real credence to the depths of space, in stark contrast to the bright lighting inside the ship. The edge definition and fine detail is tremendous and fast-panning scenes move like they're on well-oiled rails. The out-of-the-box picture errs on the rich side and atmospheric rather than eye-searingly vivacious, so unless your Blu-ray collection looks like an A-Z library of Pixar and Disney, you won't need to touch a single picture control. The picture is accompanied by a sumptuously large soundstage, rich with big-scale effects and bass to loosen your fillings. The deep throb of the ship engines is barely audible on most systems (and certainly not if you are only using a TV's speakers) but through the Denon pair you get a pervasive drone of the engines that puts you right there in the scene. Dialogue is crisp and articulate, although it was a little recessed without the Room EQ engaged. Switch to Audyssey Flat mode and it punches up the body and weight to male voices perfectly. And let's not forget that this pair does SACD and DVD-A playback with equal dexterity. You might not have bought in to either format, but the attention to detail and audio-quality engineering pay big dividends with basic CDs. Add to this Denon's compressed audio restorer for MP3s, and internet radio, and you have an accomplished all-round system that will keep ahead of the technology curve for quite a few years. No, it isn't quite as good as Denon's flagship A1HD system, but it's 95 per cent there and available for around one third of the price. It sounds like a gold-plated bargain to me.